Thank you for visiting my Website. If you have decided that it's time to move, you have come to the right place. I am always available to assist you. Buying or selling a home is one of the most important transactions you will ever make. It can also be one of the most stressful, that s why it helps to have an expert on your side. 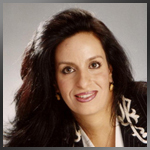 I was born and raised in Germany, speak fluently German, Farsi and English, with more than 20 years of experience in the greater Los Angeles Real Estate market. I have the skills and experience necessary to endure the successful Sale of your Real Estate-if it's your Home, Investments in Apartment building or Shopping centers or your Short sale with an international clientele in Europe, Asia and Middle East. "My mission is to provide each of my clients with extraordinary quality of service, making sure that my customers have a positive experience as they maneuver through transacting the most expensive investment they typically make in their lives is my top priority."